Do you know others who live in our district who may not be receiving my e-news updates? Please feel free to forward this e-mail invitation to them or click on the share button below. If you have received this without directly subscribing, please visit my website by clicking here and sign up to receive my e-newsletters! Although the Legislature has been out of session for two months, I am still working on unresolved issues with the proposed capital budget and with the Supreme Court’s Hirst decision that placed restrictions on household wells. I have been meeting with water-management stakeholders and conversing with my counterparts across the political aisle to find agreement that will address their concerns and let rural property owners build on their land. Unfortunately, progress has been slow and my Democrat colleagues haven’t demonstrated that they grasp how important this issue is for rural Washington. This is especially concerning in light of a recent study that demonstrates the significant financial harm caused by not fixing the Hirst problem. My Senate Majority colleagues and I noted that recently when we sent a letter to the governor asking him to demonstrate leadership and bring his fellow Democrats to the negotiating table. Failing to act will result in a loss of nearly $7 billion to our state’s economy. Please click here to read my recent press release that includes the letter and link to the study. Earlier this month I traveled to the Skagit Valley to participate in a day-long agricultural tour. I met with other policy makers and legislative staff to understand the diverse and complex agricultural environment in the valley. Growers there produce 80 crops of commercial significance, which complicates the task of navigating the regulatory environment. I learned about challenges they’re facing with farmland preservation, international trade dependence and access to water. 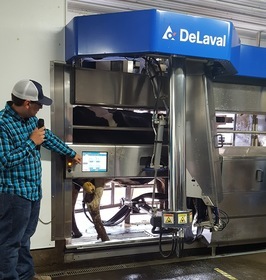 Skagit farmers demonstrated cutting-edge technology in their operations, including a dairy that is using robots to milk cows. These kinds of tours are invaluable to legislators as we think about the impact of laws and regulations on agriculture producers who are working to be good stewards of the land, while feeding our world and trying to make a living. I recently attended a meeting in Kittitas County regarding the Jolly Mountain fire. The fire has burned over 36,000 acres and is about 40 percent contained. Officials indicate that the eastern, western and southern lines have been brought mostly under control, but expect the fire to continue to burn to the north and will be closely monitored. Over 800 people had been working in this dangerous and rugged terrain. I am thankful for our first responders and firefighters who are putting their lives on the line to fight these fires and keep our communities safe. Please visit the links below to stay informed about the fire and any closures and evacuations. Our community is a hub of innovation and industry. The city of Quincy was recently recognized as a “Utility of the Future Today” and will be honored at a national conference in Chicago for its work on water reuse. Click here to read a recent news story. It is an honor to serve as your state Senator. Please do not hesitate to reach out to my office with any questions or concerns you may have regarding your state government.